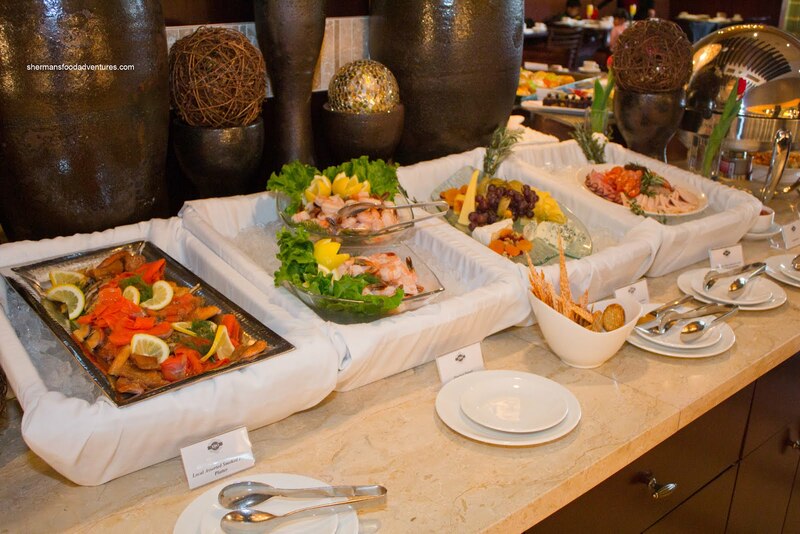 For many, a buffet is not the best place to experience great food. Think of it, the stuff is mass-produced and more often than not, the quality of the raw materials are suspect. That is probably why we have seen buffets come and go in the Lower Mainland. The Copper Kettle was something I remembered way back in my childhood. Now a Canadian Tire stands where it used to be. Uncle Willy's has been reduced to one location at Metrotown and let's not even get into Foody Goody. Sure, there are some that still stand such as New China Kitchen, Oriental and Grand Buffet, but it'll take a lot for me to actually go eat at those places. The newer type of buffets which started to show up in the 90's were of the Japanese variety which involved ordering from a checklist rather than going up and serving yourself. 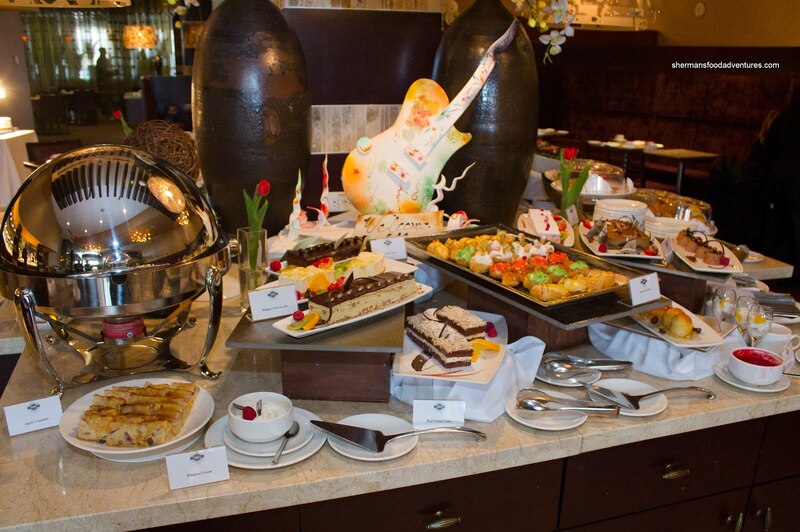 Now, from this, you might think I universally hate buffets. Not exactly. There is one type I don't mind, granted it is not particularly cheap. What I'm talking about is the Sunday Brunch. 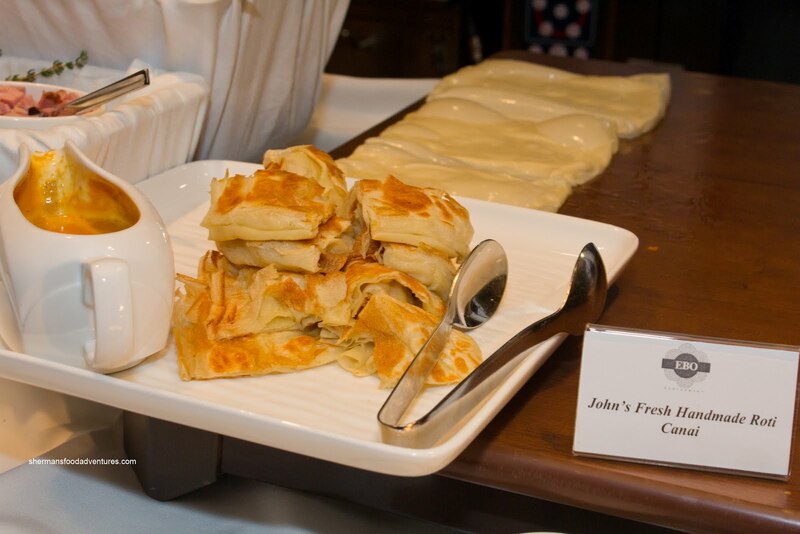 Normally found at hotel restaurants, it can range from a simple breakfast buffet to elaborate spreads that include more "gourmet" offerings. As for Vancouver, I've already tried out the Sunday Brunch at the Hotel Vancouver, Waterfront, Sutton Place, Pan Pacific, Burnaby Hilton and Fairmont Airport. 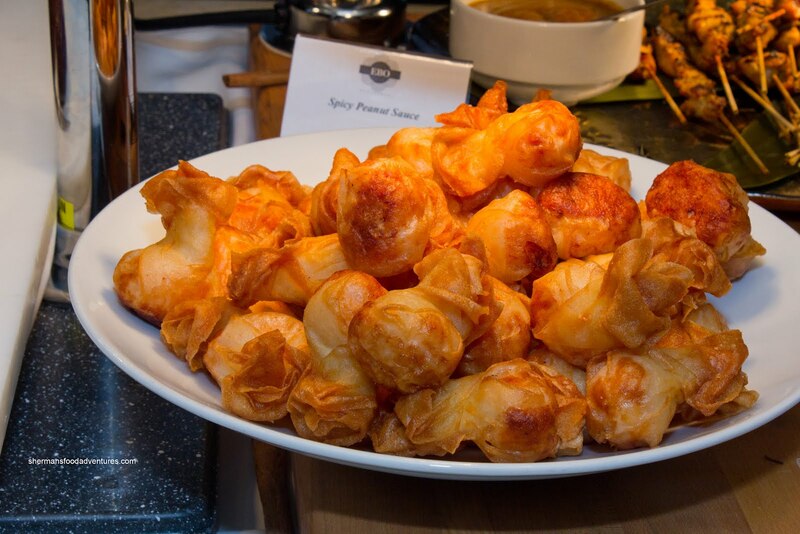 Most have been pretty decent with all things considered (as in you can only expect so much from buffet food). There was one that I was planning to try on my own, which is the one offered at EBO (at the Delta Burnaby). Coincidentally, I was invited to try it as part of a media brunch. They were gracious enough for me to invite one guest, which was Viv and also my 2 kids because really, who would take care of the kiddies otherwise? 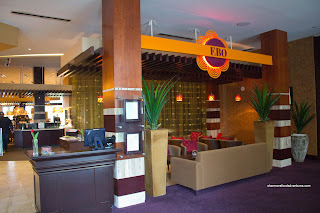 Moreover, I must admit a slight bias since EBO is one of my favourite dining destinations when I need to bring the whole family. Despite being located right next to the Grand Villa Casinos, the restaurant is kid-friendly - as the kids eat free (dinner and lunch with paying adult)! 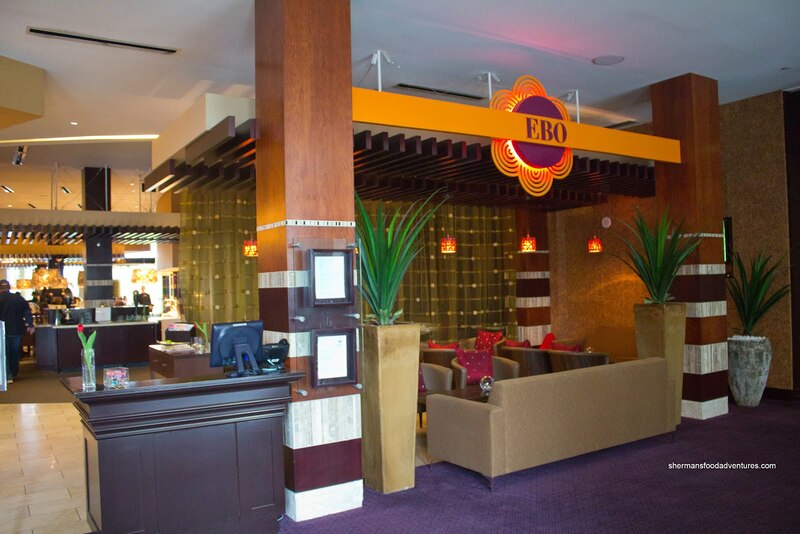 Right off the bat, without even eating a single morsel of food, there are a few things that set EBO apart from the aforementioned hotel restaurants. First and foremost, the price of the Sunday Brunch is incredibly reasonable at $30.95 with kids 5 and under being complimentary. Secondly, the parking is free. This is nothing to laugh about when the other places charge upwards to $20.00. 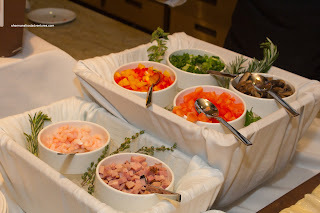 So after we settled into our table, we attacked the food starting with the usual cold items. These included Smoked Salmon, Shrimp Cocktail, Cheeses and a Charcuterie Platter. 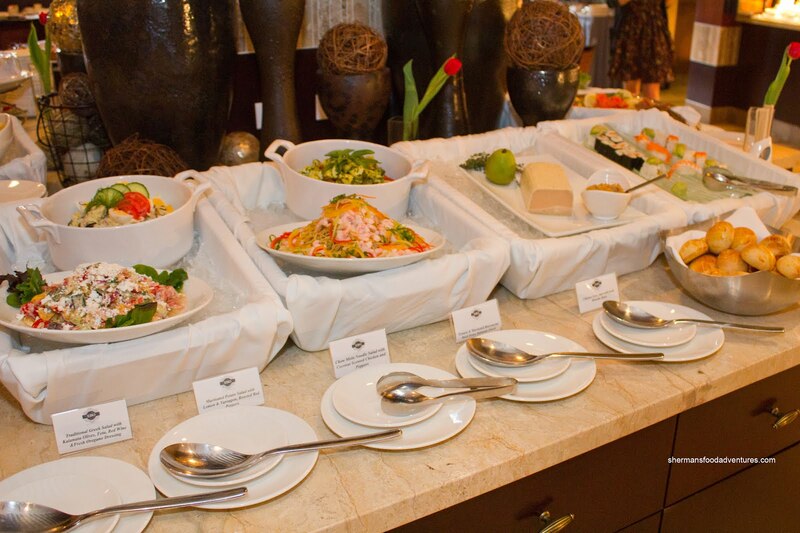 Around the corner, there was a selection of salads consisting of Greek Salad, Marinated Potato Salad with roasted red peppers, lemon & tarragon, Chow Mein Noodle Salad with coconut scented chicken and peppers, Tomato & Bocconcini Salad, Chicken Liver Pate with brioche and Assorted Sushi. Off to the hot section, there was something not usually found at Sunday Brunch - Roti Canai. And to top it off, the roti was freshly made right in front of our eyes (a la fresh noodle-making at Peaceful). In fact, they take freshness so seriously, I witnessed the disposal of roti that had been sitting around for awhile. As for the quality of the roti, I can confidently say that it would not be out of place in a Malaysian restaurant. The exterior was crisp and not too oily while the inside was a soft and chewy. 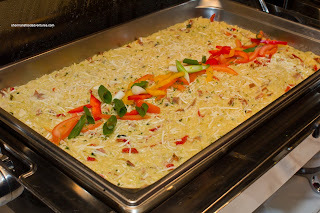 The accompanying curry dip had a nice consistency while being slightly spicy and aromatic from the coconut milk. Right adjacent to the roti was the DIY Omelet Bar which featured ham, shrimp, peppers, tomatoes, mushrooms and green onions. I did get an omelet at the end of the meal just to try it out. It was fluffy and not exposed to extremely high heat. Hence it was not overcooked nor did it exhibit any browning on the outside. 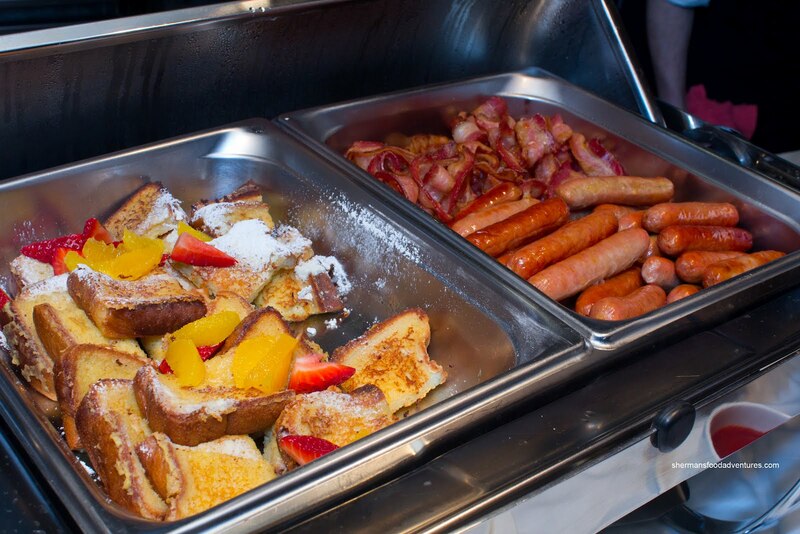 Moving along the buffet line, the first chaffing tray contained the standard Bacon & Sausages along with French Toast topped with fruit. The bacon was mostly crispy while the sausages were large and meaty. The meat was not gritty which suited my son just fine as he prefers the fatty smooth type. The French toast was not bad, it wasn't dry nor too wet. The next tray consisted of both the Traditional Eggs Benny and Smoked Salmon Benny. I tried the traditional version and it was pretty spot on. 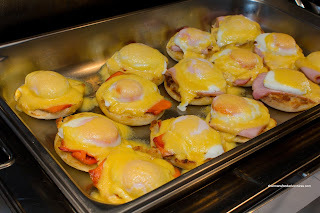 The English muffin was crisp and not soggy while the Hollandaise sauce was buttery and had a good hit of lemon. The "poached" egg was interesting as it was not immersed in water. Rather, it appears they poached the egg with minimal water where the yolk was allowed to be purposely underdone. Hence it was beautiful and runny. Nice trick. Good for the warming tray as it won't overcook. When I took a gander at the next item, I was concerned. It was Salmon and squid with a lobster emulsion. Normally, fish at a buffet can pass for styrofoam. However, the salmon here was perfectly cooked. Barely past rare, the fish was moist and soft. 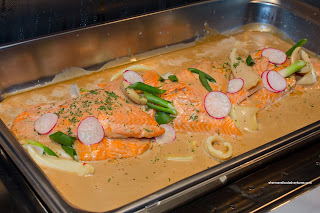 The lobster emulsion was rich, yet not too salty which allowed the fish to stand on its own. The random pieces of calamari were tender and not fishy. Without any description other than the "Chef's Pasta", I did my best to figure out what it was. Well, obviously it was Orzo and I could tell there was sundried tomatoes, pancetta and Parmesan. This was quite creamy and balanced. It was flavourful without being salty. 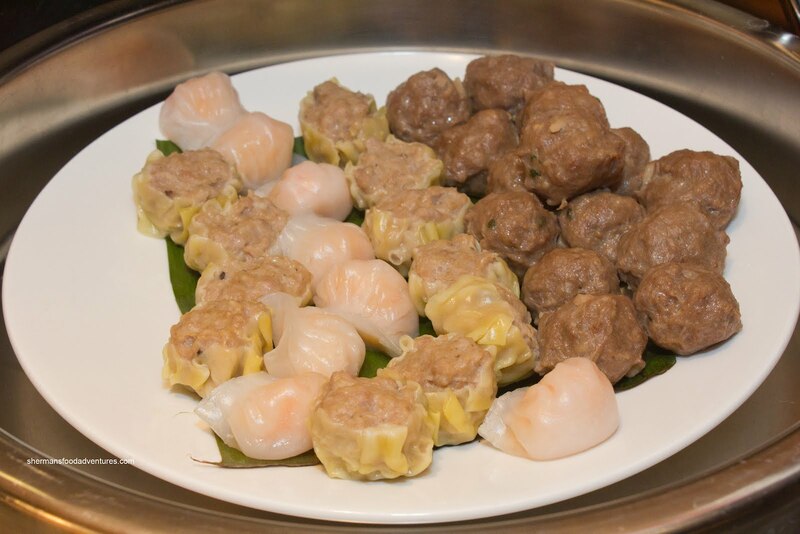 In Vancouver, it is almost a given that Sunday Brunch buffets are not complete without the token Dim Sum. Honestly, I'd much rather not see this other than in a Chinese restaurant because it is rarely done right. With that being said, the Dim Sum here was at le ast average. Sure, the rice flour dumpling skin on the haw gow was thick and dry, but the filling was actually pretty good. There was whole shrimp that exhibited a snap and also tasted right. The sui mai was pretty plain, yet the pork had a good bounce. However, the beef meatballs were a touch too rubbery. Along with the Dim Sum was something that completely blew me away - there was house-made XO Sauce! For those who are unfamiliar, XO Sauce is a Chinese condiment consisting of all or some of the following: dried shrimp, dried scallop, Virginia ham, shallots, garlic, chilis and oil. The one here was pretty legit except for a touch of fishiness. 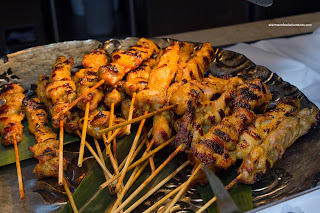 Right behind the Dim Sum was a plate of Chicken Satay which were beautifully charred. They were neither too dry nor juicy, somewhere in the middle. I felt there was just enough seasoning, yet the curry dip was needed to give the satay some punch. 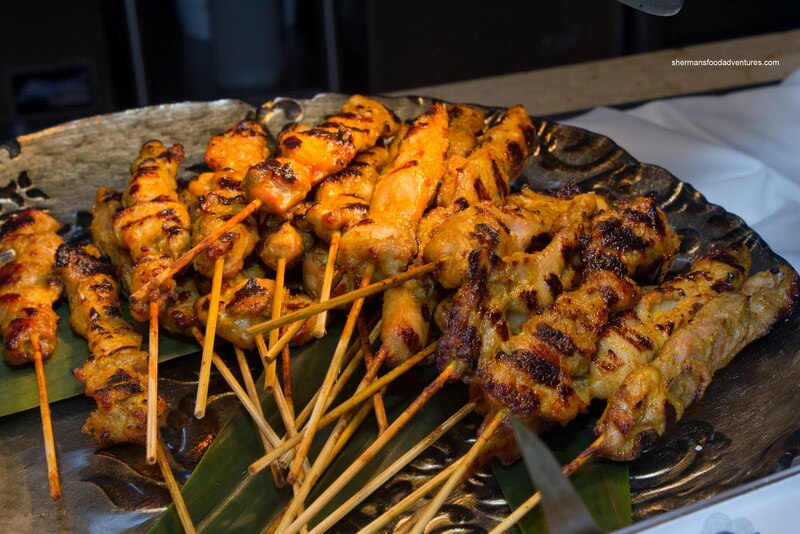 Directly in front of the satay were the Fried Shrimp Pockets (which looked like fried shrimp wontons). These were alright. The shrimp was a touch soft (since it was mixed with shrimp mousse) where the moisture affected the crispiness of the fried wrapper. If the XO sauce was a surprise, the house-made BBQ Pork totally caught me off-guard. I have never seen this offered at any of the hotels in Vancouver as of yet (and that is including Richmond). Unlike the BBQ pork found at Chinese shops, this one was significantly larger and less fatty. Hence, the meat was super moist and tender. With the long, slow roast, the flavours were rich as well. However, the one thing that really brought it all together was the cilantro-soy dip. It added a touch of spice and brightness to the normally sweet and heavy pork. 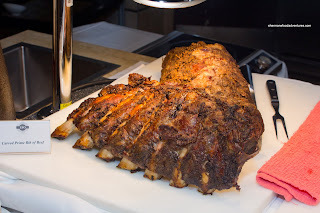 Directly beside the pork was something more typical in the Roasted Prime Rib. Even with this they were able to make it interesting. They took the beef ribs from the roast and prepared them separately. I don't know about you, but the best part of a prime rib roast are the ribs themselves. Not great for my cholesterol, but what am I talking about??? It's a buffet after all!!! Oh and about the roast, it was perfect - moist and medium-rare. And to top it all off, there was a luxurious demi-glace rather than the usual au jus. Now all this food is fine and dandy for adults, yet they didn't forget about the kiddies though. 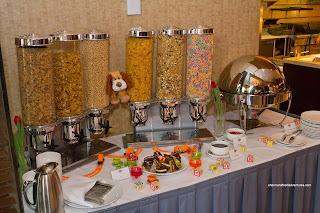 There was a table set up with various cereals, sweets, chicken strips, fries and fresh-made donut holes. Since the table was at kid height, my daughter helped herself to the fruit gelatin. Back to the rest of the spread, there was a decent selection of Desserts which included an Apple Crumble, Raisin Bread Pudding, Key Lime Cheesecake, Opera Cake, Kirsch Torte, Cappuccino Cheesecake, Chocolate Mousse, Macarons, Mango Brulee, Rum Bada, Eclairs, Red Velvet Cake and Chocolate Sacher. At this point, I was pretty full and only tried a few items which were not bad. Overall, the brunch buffet here at EBO was pretty solid especially for the price. One thing I must mention is that there were a few extra items that would normally be on rotation rather than being served every week. So YMMV on what will be there each Sunday. Another observation is that many of the items were offered in small batches (which were refilled regularly) which ensured freshness. This was a pretty solid experience which will ultimately lead to another visit someday. Ha, the Copper Kettle .... you're dating yourself, man. Good memories for me there too. 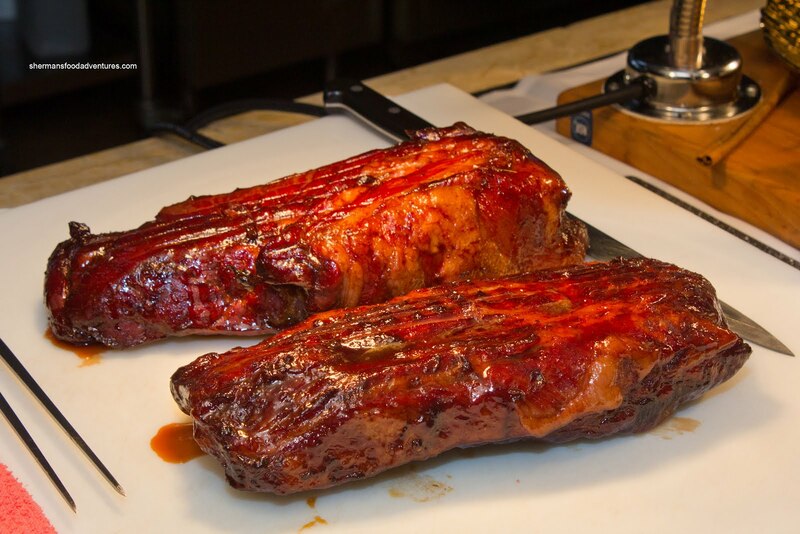 Don't forget Mother Tucker's (prime rib dinner for around $12, with AYCE fixin's like bbq ribs, corn, scalloped potatoes, salad bar etc). Boathouse used to have weekend AYCE lunch at all their locations. Don't forget, many Indian restaurants still offer AYCE lunches or dinners that are great value.